The loss of a family member is difficult for anyone. Social Security helps by providing benefits to protect service members’ dependents. Widows, widowers, and their dependent children may be eligible for Social Security survivors benefits. You can learn more about Social Security survivors benefits on our website. Wounded military service members can also receive expedited processing of their Social Security disability claims. For example, Social Security will provide expedited processing of disability claims filed by veterans who have a U.S. Department of Veterans Affairs (VA) Compensation rating of 100 percent Permanent & Total (P&T). The VA and Social Security each have disability programs. You may find that you qualify for disability benefits through one program but not the other, or that you qualify for both. 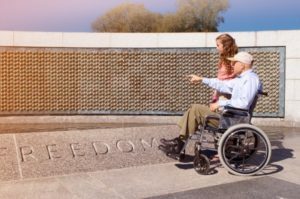 Depending on the situation, some family members of military personnel, including dependent children and, in some cases, spouses, may be eligible to receive Social Security benefits. You can get answers to commonly asked questions and find useful information about the application process on our website for wounded warriors. Service members can also receive Social Security in addition to military retirement benefits. The good news is that your military retirement benefit generally does not reduce your Social Security retirement benefit. Learn more about Social Security retirement benefits today. You may also want to visit the Military Service page of our Retirement Planner. Service members are also eligible for Medicare at age 65. If you have health insurance from the VA or under the TRICARE or CHAMPVA programs, your health benefits may change, or end, when you become eligible for Medicare. Visit us to learn more about Medicare benefits. This entry was posted in Disability, Special Events, Survivors and tagged Department of Veterans Affairs, Disability, disability benefits, MDW, medicare, medicare benefits, Memorial Day, Memorial Day 2018, military, military heros, Social Security benefits, social security disability benefits, survivors benefits, veterans, wounded warriors by Jim Borland, Acting Deputy Commissioner for Communications. Bookmark the permalink. My memories is fatally memories after 30 years suffering with major and manic Depression.now i am a survivor been 32 years in this country. We are sorry that your having difficulties trying to change your address, Vicky. My father served in the 1950’s, and has been deceased for thirty years now. I was supposed to get benefits, but the guy who ran the veteran affairs office in our small town took it upon himself to insist on sexual favors from the widows and my mother refused. So we didn’t get the benefits. So now I wonder if there’s any chance, but these websites just keep moving someone around and around websites, never getting a real answer… Thanks, shows my father was just fodder in a war machine…. Visit U.S. Department of Veterans Affairs. Thanks! have just found out that my identity has been stolen for a long, long time. how can i start receiving the benefits i have been denied for at least the last 5 years? I have just found out that my medical is terminal due to cancer and other terrible things. I need medical help asap. I have a posting on fb that said if you had active duty from 1975 to 2001 you are eligible for increased social security benefits. Would like more information on this. Hello John, under certain circumstances, special extra earnings for periods of active duty from 1957 through 2001 can be credited to your Social Security earnings record for benefit purposes. If your active duty was after 1967, the extra earnings are already on your record. See “Special Extra Earnings for Military Service” for complete information. There is also a great organization (WIngs 4 Warriors https://wingsforwarriors.org/ ) that is so helpful!